Lawyering is a noble profession, not to be confused with the untidy and significantly less elegant profession, if one can call it that, of sales. I didn't go to law school to learn how to sell. My clients trust me; they don't want some smarmy sales pitch. I can see why firms of a lesser reputation resort to such tactics, but my firm is different and that won't work here. Hogwash or doctrine? Should the modern law firm embrace sales, particularly in light of the changing economic climate where demand for legal services is no longer a given? Or will sales blow over, like TQM, and branding, and knowledge management, and six sigma, and all the other corporate fads that have no place in the practice of law? Can we even have a rational conversation about sales in law firms when we don't even call it sales but rather euphemistically refer to it as business development so as not to offend the delicate sensibilities of the timekeepers? Last week I had the good fortune to share a daïs with several experts in the field of law firm sales. Steve Bell is, to my knowledge, the first head of sales in a major US law firm, and now the CMO of Womble; Rob Randolph is the director of business development at Midwest power house Bryan Cave, a firm noted for innovation; Jim Cranston is a longtime professional sales trainer now with legal consultancy Hildebrandt; and our moderator was Patrick Fuller, Senior Business Development Executive with ThomsonReuters, the giant in information services for law firms. The venue was the annual Raindance conference, produced by the Legal Sales & Service Organization and managed by ThomsonReuters. Our host was the fine Hotel Sax, adjacent to the House of Blues in Chicago (although I would be remiss if I didn't give a shout out to the fine folks at the brand new Hotel Wit just across the bridge at State & Lake). 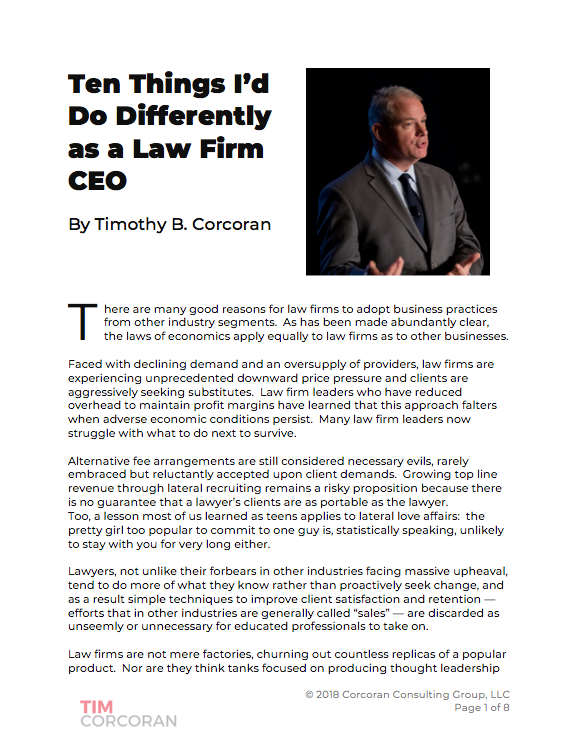 The first order of business was to question the premise: Should law firms have a sales force? The panel was of one mind that no matter what we call it every law firm has an existing sales force whose role it is to bring in new business. In most firms they're called lawyers. By the way the lawyers are also the products and the owners. Whether a firm should add extra folks whose responsibilities are limited to sales is a separate question, and turns out to be the red herring in most conversations of this sort. I've long contended that the essence of good lawyering is the essence of consultative selling. Both focus on identifying and understand problems, and finding solutions to overcoming the problems. Any lawyer who considers himself a good problem solver can also be a good business developer. And just like there are multiple approaches to solving a problem, there are multiple approaches to generating new business. There is no one-size-fits-all. There is a wrong way, of course. When you watch classic sales movies like "Tommy Boy" and "Glengarry Glen Ross" and "Boiler Room," the sort of movies that inspires poor students with winning smiles and firm handshakes to make a living by coercing others, I certainly hope you realize that this kind of selling is as far from consultative selling as playing your Wii video tennis game is from facing Roger Federer's blistering serve on center court at Arthur Ashe stadium at the US Open. We discussed the difference between Marketing and Sales. Marketing generates awareness and leads. Sales is a process of identifying needs and offering customized solutions. In this context, "closing" is a natural outcome of good needs analysis and issue spotting, rather than coercion. When you submit a proposal, if you don't have a good sense of the probability of winning the business, then you've skipped some steps along the way, guaranteed. Marketing may be all that's needed when demand is high. After all, the goal then is to direct potential clients your way rather than to an alternative supplier. Absent high demand, e.g., the state we're in today, sales (okay, business development) becomes more important. We must differentiate ourselves not by our credentials but by our ability to understand the client's business (not legal!) concerns and identify solutions to overcoming those concerns. We can differentiate ourselves as much by the use of a consultative and customized process to identify concerns and solutions, not just by the solution itself. I've recently been called upon by a few large firms to help them sort through their marketing priorities. In light of the recent slowdown, they are busier than ever trying to win new clients. My friends in marketing departments are short-staffed and working long hours fulfilling the requests for marketing support, and demanding partners don't like to be kept waiting. But let's be clear about what are good efforts to develop new business and what is merely posturing. Asking the marketing department to produce yet another practice or industry brochure or compile a pitch book of deal lists and bios to leave behind with a prospective client after a lunch meeting is not developing business. Business development cannot be delegated. Marketing can be, but to generate business you must sit with a client or prospective client and ask the questions that will uncover needs and lead to customized solutions. Pitch books are busy work, efforts that make it seem like we're making progress toward winning work by showcasing all that we can do. They have a role. But this isn't sales. The panel provided insights into the areas where sales experts can augment a law firm's own lawyers' efforts. But first, let's understand the math. No professional salesperson or sales consultant or in-house marketing & business development professional can have an impact on par with the combined strength of every member of a law firm partnership even marginally improving his or her skills at winning new business. So where can sales professionals add value? In-house and outside sales experts are catalysts. Good lawyers, even those who buy into the consultative sales process, suffer from periodic call reluctance. By contrast, professional salespeople are often eager to pick up the phone to schedule a visit or make an introduction. Cold calling and setting up meetings with people we don't know is daunting to many people, which is why many corporate sales teams have dedicated appointment setters. Look to your in-house experts to help arrange initial meetings. All sales take place on a continuum, where the suspect becomes a prospect becomes a client becomes a repeat client. Most call this the sales funnel because there are typically far more prospects than clients. Selling legal services is no different. If we take the prospective client from initial introduction to pitch within minutes, our probability of success is limited. Anyone who has dressed up to visit a client with the express purpose of reading the firm brochure to the client (we often call this a "beauty contest") is familiar with these odds. However, when we take time to get to know the prospective client, walk him through an organized analysis of his needs, prepare customized proposals that demonstrate an in-depth understanding, help quantify the impact of doing nothing, then when we ask for the business our odds are much greater. Professional salespeople are accustomed to working a process, and can help lawyers stay focused on the next step. Left to their own devices, many lawyers will hold an informative initial meeting and then wait for the phone to ring. It might help to have an expert nudge now and again. I've hired many former athletes as salespeople, and not because their imposing physical presence convinces buyers to cough up money! Athletes have a lifelong understanding of how training, repetition and a focus on details lead to success. Athletes practice fundamentals over and over and over. Do you think the layup lines and shoot-arounds before the opening tap at professional basketball games are in place merely for show? Practice leads to muscle memory. A professional salesperson will never walk into a client meeting without having scripted and practiced what will take place. Those who believe preparation consists of huddling in the client's lobby deciding who will take the lead and who will say what mere moments before walking in to deliver your pitch have as good a chance as a popcorn vendor who selects 4 teammates at random from the crowd moments before tip-off to compete against the Los Angeles Lakers. We closed by touching on compensation for professional salespeople in law firms. The mantra is that fee-splitting is not ethical and therefore not allowed by the various Bar associations. Once again, the business of law firms is unique and corporate techniques won't work here. Nonsense. Every corporation has constraints of a similar magnitude. How do you compensate the salesperson who made the original sale a year ago when the customer buys an upgrade this year from the service team? How do you compensate the team serving the customer's west coast office when the decision maker resides in the east coast office? When we bundle two more services, do we split or overpay compensation? These specific challenges may not mirror what takes place in a law firm, but should illustrate that finding a way to compensate people who are instrumental in making a sale isn't any more difficult in a law firm than in a corporate setting. Find some correlation between revenue growth and level of contribution, revisit it periodically for fairness. And try not to fall into the trap of assuming that since we made the sale, we must have been predestined to make the sale, and therefore let's discount the contribution of those who helped make the sale. Most lawyers didn't enter law school to become salespeople. And nothing I've described above requires a change in profession. Whether the objective is to improve the selling skills of the lawyers or to find the right fit for a professional salesperson on the staff, the real takeaway is that to survive and thrive in today's market requires more than waiting for the phone to ring. Solving a client's problems shouldn't be all that daunting a task. What are you waiting for?